DJ James (left) has tremendous coverage skills — a must! 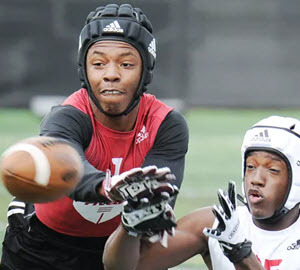 DJ James of Spanish Fort, Florida: this is a must for this recruiting class due to his extraordinary skills and considering the thin line-up at cornerback. Cross your fingers that his LOI comes in! Jamal Hill of Morrow, Georgia: a hard-hitting safety that SEC teams wanted and finishes out the needs in the defensive backfield for the 2019 class. Logan Sagapolu of Lehi, Utah: a massive center who will become the future anchor on the offensive line that coach Mario Cristobal highly covets. All three of these recruits are available because they did not sign with the team they verbally committed to originally. The lesson is — any recruit who verbals to you but does not sign during the December period is now everyone’s target out there for the February signing. Nearly all the players Oregon is signing or pursuing were someone else’s verbal at one time. Kristian Williams of Memphis, Tennessee: a defensive tackle who can help secure the depth needed at defensive line for years to come as he grows into a run-plugging role. Could Oregon get good news about WR transfer Juwan Johnson? Kyle Ford of Orange, California: an uber-talented wide receiver who could help Oregon. Puka Nacua of Orem, Utah: the offensive MVP of the Polynesian Bowl is one the Ducks would love. Ismael and Rodney Sopsher of Amite, Louisiana: a massive all-star Nose Tackle and his JUCO DE brother. When you consider the sparse number of recruits left after the December signing and the intense competition for them, it illustrates the importance of signing all your verbals in December as Coach Cristobal and staff achieved in the early signing period. A clutch performance by the coaches then, now puts the Ducks in a position of “adding the icing” to a superb class already assembled. As the big day progresses–let’s discuss this class in the comments!